Hitachi, the Japanese electronics giant, has been around for 102 years. Recently they went through one of their worst periods in company history. During the four year period from 2006 to 2010, Hitachi went through a company depression where the total losses equaled $12.4 billion. The losses were the worst in company history. The following two years they posted record profits. In 2011 alone, they posted a net profit of $4.35 billion. Hitachi under Mr. Nakanishi has broken away from a plodding, risk-averse style of management, spinning off at breakneck pace its consumer-related operations in mobile phones, computer parts and flat-panel TVs to concentrate on selling big-ticket—and more profitable—power plants, rail lines and water treatment facilities. So what is Mr. Nakanishi’s next move? By the year 2015, Mr. Nakanishi’s goal is to double the profit to almost 10%. Ten percent doesn’t seem like much when you consider that some companies have 20% to 30% profit, but when you consider the size of Hitachi, a 10% profit margin is huge. So how was Nakanishi able to turn the company around so quickly and drastically? He had a vision. He determined where he envisioned the company in the future. When he set his vision, he set it very high. I would imagine that when he set it, he probably didn’t even know how he was going to reach his vision. As a leader, you should also set a vision for yourself and your company. Your vision should stretch you! When you set your vision, it should be your top goals that may seem nearly impossible to obtain. Think about the vision Mr. Nakanishi set. 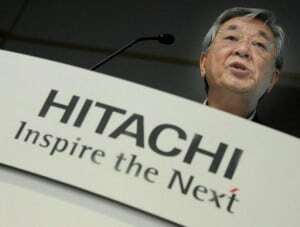 Who would’ve thought three years ago that Hitachi could turn around so drastically? They were suffering record declines in the organization and now they are experiencing record profits. At that time, no one would have thought his vision was realistic, but now it seems much more realistic. When you set a vision for yourself or your company, you should put it in a place where you can see it every day. In addition to having it in a visible place, you should make it a point to read it every day so you keep it relevant and on your mind. Another important fact about your personal vision, not necessarily the company’s vision, is that as you grow and evolve you can change your vision. Maybe what you had as a vision a year ago isn’t as relevant now as it was then. Or, you may have changed your priorities so it isn’t something that you want anymore. If that is the case, adjust your vision to fit your change in priorities. If you don’t have a vision for yourself or your company, you won’t have a direction. Without a vision, you will just wander aimlessly. The vision will help you have purpose. It will give you direction as you go forward. It will also give you a sense of stability because it will help you know you are accomplishing something every day. A vision will help to reach greater heights in your life and in your career. Have you set a vision for yourself? How has it helped you in your life? Why is having a vision important to you? Please share your thoughts and comments in the comments section below!